Dumpsie Dearie Jam is a recipe which was given to me by an old neighbour... from memory I believe she said it was an old Gloucestershire recipe! I love the name - and the taste!! Lovely with freshly buttered fresh bread out of the oven! Take the plums and cut them in halve and remove the stone. Core the apples and pears and peel the skin. Take a large pan and and put all the fruit into it. Add the lemon zest and juice, cloves (ground) and ginger root (bruised). On a genle heat simmer until the fruit become soft. (If the fruit starts to stick to the pan add some water - just a little). Add the sugar and stir in until it is dissolved and bring to the boil. Boil rapidly for 15-20 minutes until it reaches setting point. 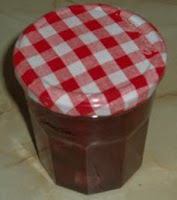 Pour into jars (sterilised) and seal. Spread over fresh bread and enjoy! Cañoncitos de Crema - Cream Canons!